We’re here once again with another ridiculously awesome RECORD OF THE WEEK blog! The top pick this week has got to be one of the coolest looking records we’ve ever pressed, and definitely a contender for the almighty ‘Record of the Year’ crown! 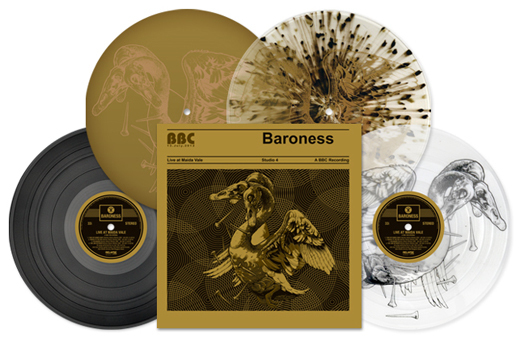 From Relapse Records comes BARONESS’ “Live At Maida Vale”! This incredibly impressive and limited release features a live recording of the band from the historic BBC Maida Vale studios, a gorgeous silk-screen of frontman John Baizley’s art on the B-Side of the wax, available in in a handful of beautiful colored configurations! If that wasn’t enough, the semi-gloss jacket also includes Metallic Spot PMS printing! There’s no arguing that this is one of the most stunning releases we’ve ever had the privilege to press, and for one of the raddest bands around! Kudos all around to Relapse and Baroness for a job very well done. The first honorable mention this week comes from VELA EYES, who self-released a killer 10″ with FOUR different and equally awesome colored vinyl configurations! They really covered all the grounds here with Half-N-Half, Splattered, Standard Colored, and AsideBside Vinyl! Top that off with a printed insert and Reverse-Board Jacket, and you have one hell of a nice package…Nice! The latest 12″ LP from DAVID YOW includes an awesome Matte Jacket and two super-sweet Black / Grey colored vinyl choices! That AsideBside configuration with White and Gold Splatter is outta’ control! COUNT YOUR LUCKY STARS went all out on this 10″ repress of EMPIRE! EMPIRE!’s “When the Sea Became a Giant”. I can’t tell if like the Baby Blue / Easter Yellow / Doublemint Tri-Color or the ‘Beer’ in ‘Electric Blue’ color-in-color more… Ahh who cares, they all look fantastic! You can’t go wrong with a band name like THE ERECTIONS! That ‘Royal Blue’ Vinyl w/ Splatter is a beauty, as is the ‘White’ / ‘Red(ish)’ AsideBside. Definitely rad to see some punk coming out of Japan these days!! From Australia’s POISON CITY RECORDS comes a classy new self-titled 7″ release from DAYLIGHT ROBBERY. The ‘Doublemint’ and ‘Bone’ colored vinyl choices were spot-on, and that reverse-board jacket came out great too! Definitely a good-looking package…. This double LP from LYCIA is a beast! Milky Clear’ vinyl w/ Dookie Brown Haze and a Matte Gatefold Jacket…. I’m sure fans of the band will be all over this one! Last but certainly not least is the latest LP from the Finnish metal titans in CHILDREN OF BODOM entitled “Halo of Blood”. 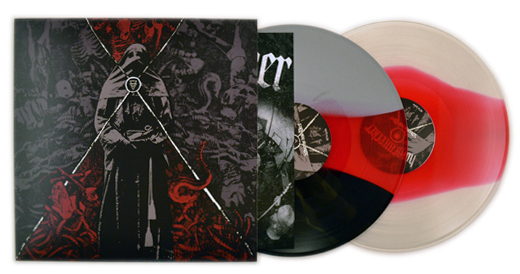 Gatefold jackets, printed inserts, and 3 different colored vinyl choices? What a beauty! Commence the headbanging!! That does it for this week’s blog! A HUGE thanks to all of you who continue to read our blog every week- your support does not go unnoticed! As always, check back next week for another round of amazing records, and repost this link if you feel so inclined… Until next time, VINYL RULES ALLLLLLLL.